Founded in 2012, Beckett Simonon is a young and ambitious shoe brand, which uses innovative production techniques in order to preserve their vision for ethically handcrafted footwear. Where Are Beckett Simonon Shoes Made? What Is The Group Made-To-Order Model? Otherwise, scroll down to read it all! You can use the following links to either head straight to Beckett Simonon or read our current reviews of their footwear. Alternatively, continue scrolling to continue reading about this unique brand. Dubbed the “Warby Parker Of Shoes” by Inc. Magazine, Beckett Simonon has a rich background despite its young age. Beckett Simonon was founded by long-time friends Nicholas Hurtado and Andrés Niño as a brand that offers premium yet affordable footwear for discerning gentlemen. Ethically handmade by craftsmen in Bogotá, Colombia, Beckett Simonon shoes offer something truly unique in the men’s footwear market. We were so impressed that we approached them to form a partnership. 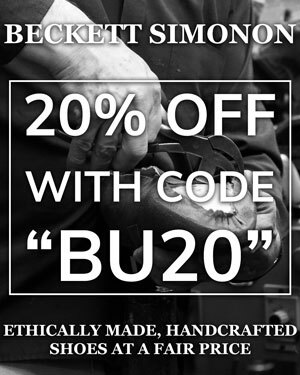 As a result, you can benefit from a 20% discount with the code “BU20” when purchasing Beckett Simonon shoes. As mentioned above, Beckett Simonon is a young company yet has a rich history and background. Having met over twenty years ago, Colombian duo Nicholas Hurtado and Andrés Niño share a long friendship that first started in school. In those days, their shared interests were punk rock and skateboarding. However, this unexpectedly planted the seed that would be Beckett Simonon several decades later as it sparked a passion for the DIY culture. What started out in an interest in clothing and working with their hands, grew into an admiration for artisanal craftsmanship. While Hurtado and Niño attended university, their personal styles and tastes developed and gravitated towards menswear. Yet, they still preserved the DIY spirit from their earlier years. Therefore, once finished with their undergraduate studies, together they launched Hasso, a leather good company. Hasso was a successful venture and their brand was distributed in 13 countries. Although it was a stable business, neither Hurtado nor Niño felt fulfilled and were eventually disillusioned by the retail market. What troubled them the most was the level of waste involved in the process. Once their products were manufactured, they were exported to distribution agents. After arriving at the warehouses, they were then dispatched to regional distributors before being delivered to the retailers. By the time their wares on displayed, they were often retailed at six times the original production cost. However, the duo then learned that half of the goods were never even sold and it was this fundamentally pained them the most. Niño and Hurtado were left unsettled by this reality even though it is generally regarded as the norm. Rather than follow the encouragement to grow the business, they liquidated their inventory and closed the brand. Refusing to adapt and conform to a system that perpetuated waste, Andrés Niño and Nicholas Hurtado instead channelled their counter-culture spirits of their punk rock youth. A few months later, Beckett Simonon launched as an independent company operating online solely from their own website. With no middleman, they had complete control of production and their economical use of resources. Beckett Simonon grew at an unprecedented and unanticipated rate. Consequently, they experienced issues with quality, logistics as well as customer service. Concerns grew that the business wouldn’t work and so they again sought consultation. On this occasion, they were instead urged to cease with their new venture and return to a more conventional model. However, Hurtado and Niño truly believed in Beckett Simonon and chose to again disregard this advice. Their combined passion gave them the resources to harmonise their operation. The gambit paid off and Beckett Simonon today has a community of over 25,000 happy customers. Beckett Simonon was not only founded upon the values of affordable footwear or traditional manufacturing methods. In fact, one of their fundamental principles is ensuring an ethical and responsible brand in a global society stigmatised by waste and consumerism. This begins by guaranteeing the working conditions of their craftspeople. In an era of exploitation, Andrés Niño and Nicholas Hurtado sought to secure their skilled craftspeople with the necessary wages, paid vacation time as well as a pension and health insurance. However, the brand doesn’t stop there are they have fostered relationships with suppliers that have programs for responsible water, chemical and waste management. 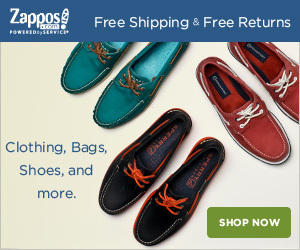 The long-lasting quality of their footwear also plays a role in this philosophy. By providing accessible premium shoes, it creates the opportunity to ultimately reduce the waste of low-quality footwear being thrown away by negating their need to be bought in the first place. Additionally, the made-to-order business model described below also helps reduce impulse purchases. As Beckett Simonon shoes require time to be manufactured, it encourages the customer’s forethought in making the commitment. Finally, their model also plays a great role in waste reduction in both an economical and ecological sense. As mentioned above, so much products are left unsold in retail. As businesses believe that selling or donating their products at heavily discounted prices will undermine their value, they often prefer to incinerate or dispose of them entirely. Instead, Beckett Simonon ensures that every shoe produced is a fulfilment of a genuine order made by a customer. After preserving a challenging investment and development process throughout 2017, Beckett Simonon shoes are now made from their own workshop in Bogotá, Colombia. Having stood for three generations, the workshop is unique in Colombia as it is the only one that follows the brand’s processes and methods. A particular hurdle was in acquiring the necessary craftspeople with the skills required to produce their shoes. Yet, they have succeeded in assembling their own team of the most skilled artisans since the brand was founded in 2012. However, before Andrés and Nicholas brought Beckett Simonon to their home country, their shoes were manufactured in Portugal. Production initially took place in Portugal largely thanks to a family connection. While Nicholas and Andrés were satisfied with the production quality, they felt that the structure wasn’t quite adapted to the vision they shared for Beckett Simonon. Firstly, large shoes manufactures in Portugal often host a myriad of brands in order to sustain continuous production. As such, Nicholas and Andrés had little restricted access due to the confidentiality of neighbouring brands. Given that their footwear business was founded upon a Group Made-To-Order model, they needed both creative freedom and production flexibility. Therefore, they sought a solution that would grant them a closer relationship with the manufacturing and design processes. Similarly, as their production orders would vary between campaigns, Beckett Simonon required freedom from the order minimums of large-scale factories. As outsourcing production can costs brands a certain premium, manufacturing in Portugal didn’t conform to the brand’s low cost and high value identity. Therefore, Andrés and Nicholas quickly realised that outsourcing production was not fitting with their direct-to-consumer vision. As such, they developed their own workshop in their home country to provide a veritable manufacturer-to-consumer business. One of the secrets to Beckett Simonon’s formula is their Group Made-To-Order business model. While the concept has existed for a long time, Beckett Simonon’s approach is unique. A Made-To-Order (MTO) process is typically where the customer pre-orders a production and it is then manufactured. This particular model can be quite costly as production is dependent on the orders but reduces waste entirely as no more shoes are made than necessary. Meanwhile, the Group Made-To-Order process has the benefit of low-waste but costs less as it follows a fixed production run. Beckett Simonon have adjusted this process to fit with their model through campaigns much like crowdfunding. The brand will run campaigns over a fixed period of time, which is essentially a window where clients will place their orders. The campaign window then closes when its period has elapsed or a certain quantity of orders have been made. However, unlike crowdfunding campaigns, Beckett Simonon will produce every shoe ordered in the allotted time regardless of quantity. The result benefits both Beckett Simonon and the customers. From Beckett Simonon’s perspective, the brand has immediate access to the funds necessary to use high-quality materials and construction techniques while respecting their vision of ethical craftsmanship. As there is no excess production or waste, Beckett Simonon are able to save significant manufacturing costs. In turn, the customer ultimately benefits they ultimately pay considerably less for their premium shoes. Given that Beckett Simonon only make the quantity and sizes that are actually ordered. Therefore, there is a resulting six to eight-week waiting period while the shoes are manufactured before they can be dispatched to the customer. Nevertheless, discerning shoe enthusiasts who recognise the quality for the low price will realise that it is well worth the wait. Under the watchful gaze of the workshop’s resident cat, Manchas (meaning “Stains” in Spanish), the manufacturing process generally takes about six weeks to complete. Hundreds of steps are involved in producing their footwear but below is a simplified breakdown of the process. Before production begins, the raw materials are meticulously inspected. As the shoes are full leather, extra care is taken during this step. All of Beckett Simonon’s shoes are crafted from high grades of full-grain Argentinian calfskin leather. Once the hides are ready, the process of hand-cutting and skiving the leather can begin. Surprisingly, this step can take over a week alone as the edges of the leather are hand-waxed and sometimes even hand-sanded. After the components have been properly cut and prepared, the shoes undergo a meticulous stitching process. Once again, the process is particularly lengthy as every shoes is assembled with 11 to 12 stitches per inch. Although dense stitching is more labour-intensive, Beckett Simonon commits to this as it will ensure a strongly-built shoe that stands the test of time. The linings are also attached during the stitching process. This can be particularly complex as Beckett Simonon uses wholecut linings from a single piece of leather. The result is a more comfortable shoe as there are no seams or joints in the interior. With the uppers now assembled, the shoes are given their final shape before they are lasted. This is achieved by using vapour on the uppers, which exposes them to heat and vapour. Beforehand, tox box and heel stiffeners are attached to the shoes as well as interlinings in the quarters for certain models. This delicate process requires that both the temperature and leather elasticity are regularly checked. The uppers are then lasted using a pneumatic press once flexible enough. This process gives the shoes their final shape aside for the waist, which is lasted by hand with a hammer and pliers. The hand lasting of the waist is a conscious choice by Beckett Simonon to design it with a taper that improves the arch support. Lasting is followed by a maturation process of between 48 to 96 hours. The uppers are left on the lasts to naturally cool down and stabilise so that eventually adapts to its shape. Beckett Simonon’s team are particularly fond of this particular step as the maturation process results in a shoe with a superior shape that endures for years. After having fully matured, the shoes are then given their final assembly and the outsoles are attached. Beckett Simonon used to produce Goodyear welted shoes. However, they have recently made the conscious decision of opting for the Blake Stitch construction. Although the Goodyear welt is often revered as being the best construction method, it is incredibly labour intensive without providing many genuine benefits. Firstly, it results in what is usually a heavy and bulky shoe. Furthermore, they can take a long time to properly break in. The supposed benefit is that the Goodyear welt can be easily resoled as many times as you want. However, since a shoe is rarely resoled more than every three years, it therefore does not offer much more than a Blake stitch. Meanwhile, the Blake stitch allows for more streamlined and lightweight shoe designs. They are also easier to to break in and ultimately more comfortable. Once the construction has been finalised, the leather is condition with a mix of Carnauba wax and Gardenia cream. Also known as Brazil or palm wax, Carnauba wax has emollient properties that produce a glossy finish when buffed. Meanwhile, Gardenia cream is an intense moisturiser that nourishes the leather and leaves it supple. Finally, the shoes are thoroughly polished before being packaged. Watch the process and see the magic yourself with Beckett Simonon’s own video below. If you look carefully, you may catch of glimpse of Manchas! It’s rare that we’re so impressed by a particular shoe brand. While some of our favourites are featured on our guide to the best dress shoe brands due to quality or price, Beckett Simonon has excelled at both. With its Group Made-To-Order approach, Beckett Simonon is able to provide ethically-handcrafted full-grain Argentinian calfskin shoes. This in itself is impressive. However, their low price makes it extraordinary. Therefore, we approached Beckett Simonon in order to see what could be provided for our readers. The result is an exclusive 20% discount code that you can use when purchasing shoes on their site. Just use the coupon code “BU20” during check-out on BeckettSimonon.com in order to obtain your discount! Durant: A traditional blind brogue with exquisite details. Dean: A classic Oxford shoe with a balmoral cap toe. Reid: An all-leather handmade sneaker. Use the links above to jump down to each shoe or scroll down to see them all. 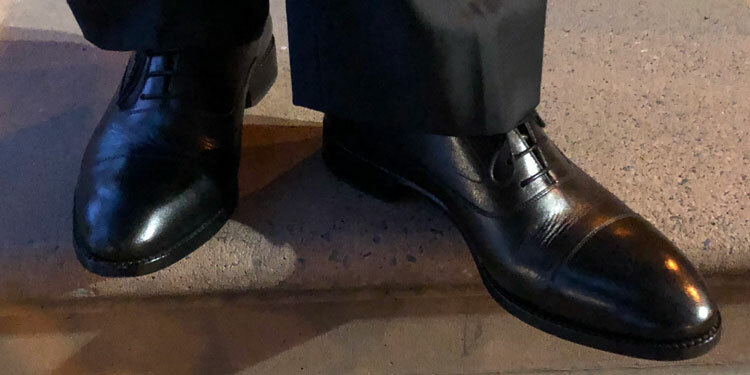 With their subtle use of perfing and minimalist perfing, these are understated brogues that are perfect for conservative environments. Furthermore, these are considered blind brogues as they don’t feature a toe medallion. 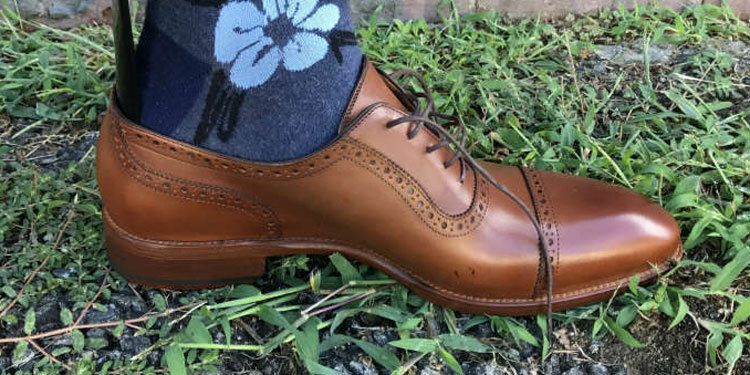 Rather than wingtips, the toe is adorned by a balmoral toe cap. The subtle brogue ornamentation make these very versatile dress shoes that can be used for a rich variety of occasions. As they’re much more streamlined than regular brogues, they’re less casual but enjoyably more formal. Available in black, tan or Bordeaux, there’s a variety of colour schemes to choose from. We prefer both the tan and Bordeaux but thanks to the subtle brogue design, they also look great in black. A classic Oxford shoe by Beckett Simonon, the Deans are handmade from Argentinian calfskin with a Blake stitch construction. They’re the quintessential dress shoe and the brand’s interpretation of the classic design is wonderful to wear. Perfect for all formal and professional occasions, these are traditional Oxfords through-and-through. They feature a classic balmoral toe cap as well as a closed-laced throat. The Dean is the ideal traditional dress shoe for all your formal needs. Although available in tan leather too, we prefer black Oxfords as a general rule. You’ll find that they’re much easier to wear in professional environments as well as formal dress codes. 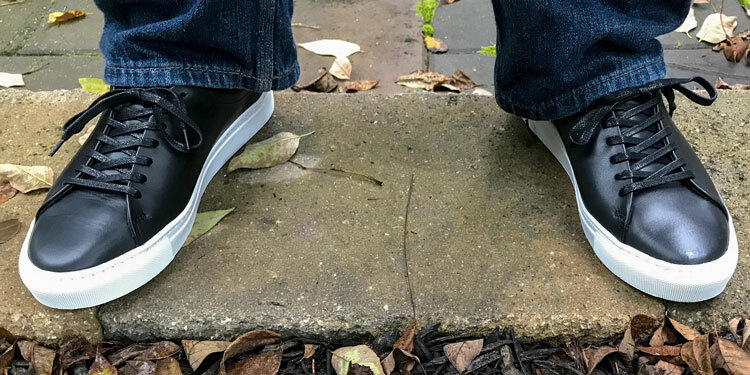 Made from Italian full-grain calfskin leather, the Reids are exceptional sneakers. Constructed using a side-stitch method with folded topline edges, they feature thick wedge soles with a herringbone design. An excellent high-quality casual shoe, these are great sneakers to wear daily or to reserve for special occasions. While some proponents of wearing suits and sneakers would love these, we adore them as a casual option. The Reid sneakers can be offered in either black, tan or white depending on the current campaign. Each colour option comes with a white sole. With their Group Made-To-Order business model, Hurtado and Niño have successfully preserved traditional shoemaking as well as the quality of their shoes. Beckett Simonon continues to grow and is quickly garnering worldwide renown for its quality at an accessible price point. Yet, the brand is unwavering in its fundamental principles and philosophy, which is deeply woven into its unique identity. 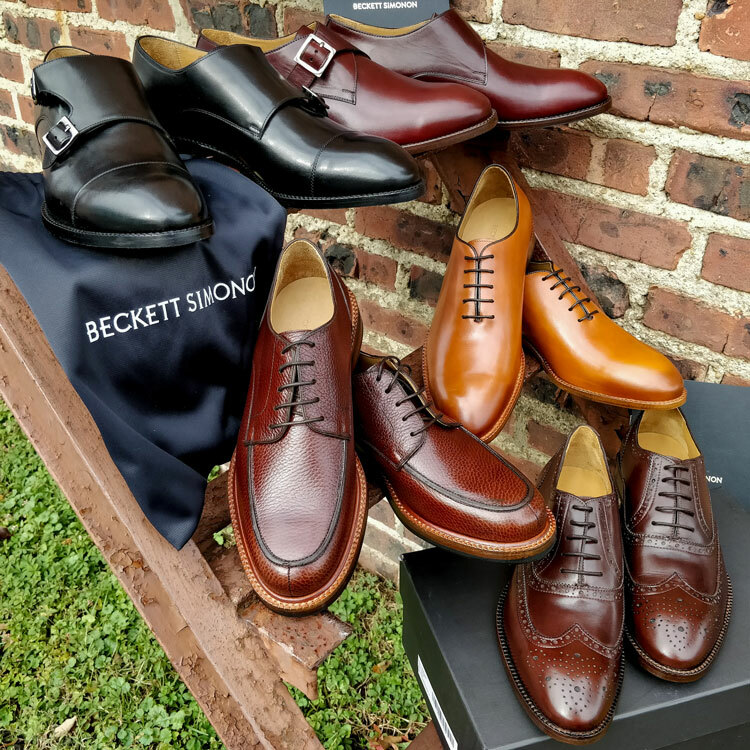 We expect Beckett Simonon to soon be internationally regarded as a major shoemaker, which offers an ethical and affordable alternative to big brands. While purchasing from Beckett Simonon comes with a delay, you will soon realise that they’re certainly worth the wait. After all, their shoes are a labour of love crafted just for you. Reviewed by Charles-Philippe, on 25th October . "Affordable yet prestigious craftsmanship. Quality dress shoes handmade by skilled Colombian artisans, Beckett Simonon is a unique brand with ethical values."